Welcome to the 41st edition of the Hip Tranquil Chick podcast: a guide to life on and off the yoga mat. Produced from the Pink Palace in Washington, DC. Today’s podcast is an interview with Amanda Hirsch on living off script creatively, topped of with a pose of the podcast, hip tranquil chick suggestions, and fun podsafe music! View our shownotes at hiptranquilchick.com/blog. Amanda Hirsch believes everyone’s story is important, and has made a career out of using the Web to tell people's stories in compelling and creative ways. As the director of PBS Interactive, she worked with dozens of independent media makers to tell stories from all over the globe, with award-winning results. Having recently made the leap into freelancing, she looks forward to continuing to explore the possibilities of interactive storytelling. Amanda started her blog, Creative DC, to tell stories that were closer to home. She believes that there is an incredible creative community in DC, it can just be hard to find; she hopes Creative DC makes the search a little easier. Amanda is also an actress who performs with the local improvisational comedy troupe, Jinx – a group that delivers humor through the portrayal of authentic, believable characters. 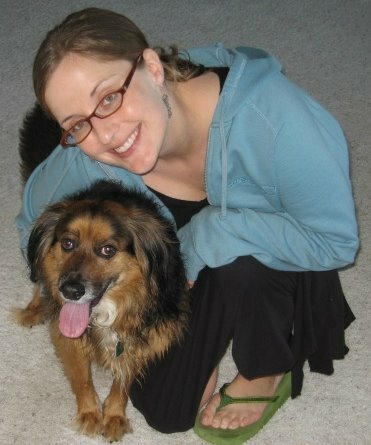 Amanda lives in Adams Morgan with her husband, Jordan, their dog, Cosmo, and a host of stories waiting to be told. To close out the show, we’re playing podsafe music---by new and independent artists who are sharing their music through podcasting from the Podsafe Music Network. Today’s selection is Trouble in Paradise by DJ Cristo. You can learn more this week's featured artist, including how to get more of his music, at djcristo.co.uk. Thanks for joining me for the 41st edition of the Hip Tranquil Chick podcast. Namaste! I recently got stuck on week 6 of The Artist's Way. It's a real pity because it greatly enhanced my life up until then but for some reason I just couldn't bring myself to carry on. I think I just have too much going on right now and it's a book to do when you are able to focus on it fully!! Well worth buying and I hope to carry on with it again soon.